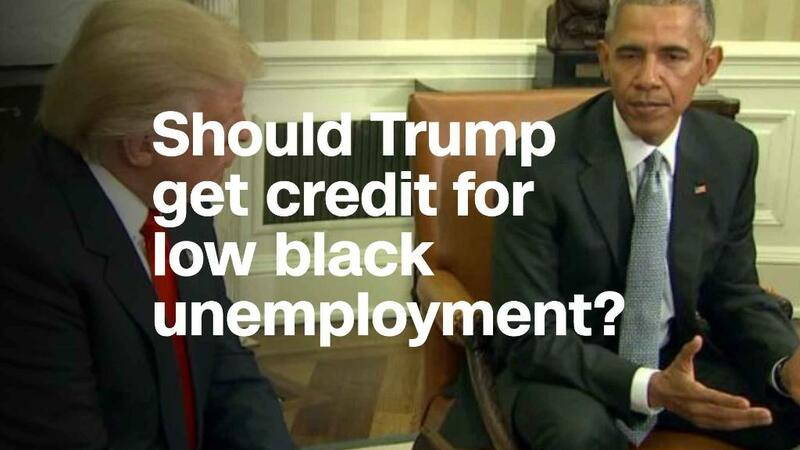 Black unemployment is near an all-time low, but that only tells part of the story. One in every five working-age black men in the United States did not work at all in 2016, nor earn any income. "It's staggering that this level of black men are disconnected from the workforce," says Janelle Jones, an analyst at the Economic Policy Institute who co-authored a recently published, wide-ranging report on hours worked by all workers ages 25 to 54. EPI is a left-leaning research group. The share of prime age men not working varies considerably between races. For white and Hispanic men between the ages of 25 and 54, the figure was 10% and 11% in 2016, respectively. Over 21% of black men did not work at all in 2016. That's up from 12.8% in 1979, the first year of EPI's analysis. In December, black unemployment hit an all-time low of 6.8%, according to the Labor Department data that goes back to 1972. And since then, President Trump has taken credit for the feat. After Jay-Z criticized Trump in an interview with CNN's Van Jones, Trump tweeted, "Somebody please inform Jay-Z that because of my policies, Black Unemployment has just been reported to be at the LOWEST RATE EVER RECORDED." The black jobless rate ticked up in January, but Trump continues to tout the December figure. Janelle Jones, the analyst, argues that the fall in black unemployment is a welcome sign, but it's not anything to get excited about. The white unemployment rate is 3.5%, Hispanic unemployment 5%, Asian unemployment 3%. "If the white unemployment rate was 7%, nobody would say 'mission accomplished,'" says Jones. "In any other context, this is not that great." As for the high number of out-of-work black men in their prime working years, Jones says a collage of factors are at play. The disproportionate number of incarcerated black men is one reason. A lack of job opportunities for formerly incarcerated black men is another. "When they come back into their communities, what are we doing? What can they do? What are their economic prospects?" Jones asks rhetorically. Additionally, education levels have a key role in a person's ability to find any kind of work, even if some jobs don't require high school diplomas or college degrees. Of the black men who didn't earn any income in 2016, 75% had a high school degree or less. The majority of nonworking, prime age black men are out of a job involuntarily -- that is, they want to work. But illness, disability or an inability to find work hold them back. That trend is true for the same demographic of white and Hispanic men, but the issue is less acute. The EPI study examined hours across demographics and gender between 1979 and 2016. Overall, it found all working-age men are working fewer hours, or at all, than they were in 1979. Nearly a third of all working-age women had no job at all in 1979. That figure dropped to 19% in 1999, but has since drifted back up to 24%. Female participation in the U.S. economy was a major area of interest for former Fed Chair Janet Yellen. Correction: An earlier version of this article attributed a characterization of the decline in black unemployment to CNN's Van Jones. It was meant to be attributed to Janelle Jones of the Economic Policy Institute.